The Google Spreadsheet integration with Zoho Projects helps you to collaborate with your team, as you continue to work in spreadsheet. 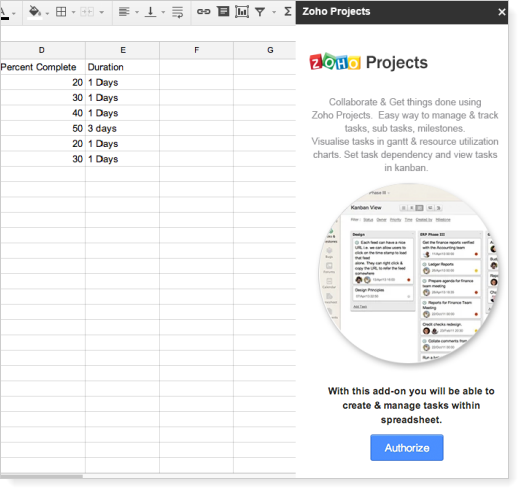 You can add a project or a task right from within Google Spreadsheet into your Zoho Projects. 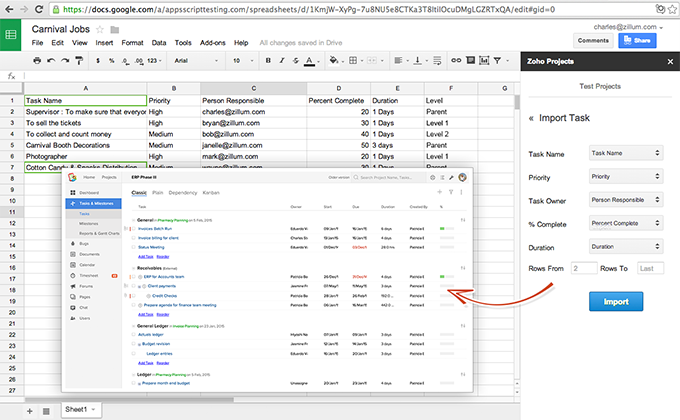 You can add any required task from Google Spreadsheet into Zoho Projects or import a set of tasks. And you can also add a project too. In Google Spreadsheet, click Add-ons. Click Get add-ons and then select Zoho Projects from the displayed options. Click Connect to Zoho Projects, to complete the authorization. Zoho Projects is now displayed in the Add-ons drop-down. To add the required tasks from the spreadsheet, click Add Task to add the selected tasks from Google Spreadsheet into Zoho Projects. 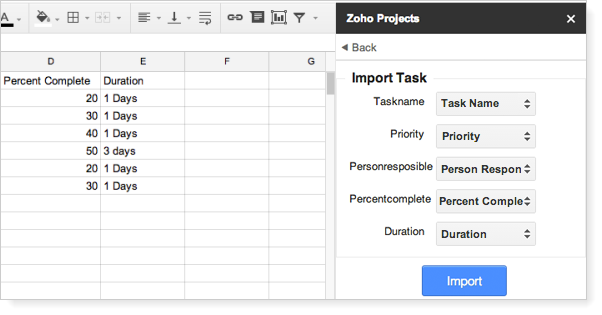 To import all the tasks, click Import Task and then map the Task Fields of Zoho Projects with the Cell Headers in Google Spreadsheet. Click Import to import all the tasks into Zoho Projects. Now, instantly connect to Zoho Projects in Google Apps!